Discworld Noir was a superb adventure game, but is also notoriously unreliable, even in Windows on real hardware; using Wine is just not going to work. After many attempts at bringing it back into working order, I've settled on an approach that seems to work: now that qemu and libvirt have made virtualization and emulation easy, I can run it in a version of Windows that was current at the time of its release. Unfortunately, Windows 98 doesn't virtualize particularly well either, so this still became a relatively extensive yak-shaving exercise. These instructions assume that /srv/virt is a suitable place to put disk images, but you can use anywhere you want. A modern laptop CPU is an order of magnitude faster than what Discworld Noir needs, so full emulation isn't a problem, despite being inefficient. There is deliberately no networking, because Discworld Noir doesn't need it, and a 17 year old operating system with no privilege separation is very much not safe to use on the modern Internet! Windows 98 installation CD-ROM as a .iso file (cp /dev/cdrom windows98.iso) - in theory you could also use a real optical drive, but my laptop doesn't usually have one of those. I used the OEM disc, version 4.10.1998 (that's the original Windows 98, not the Second Edition), which came with a long-dead PC, and didn't bother to apply any patches. A Windows 98 license key. Again, I used an OEM key from a past PC. A complete set of Discworld Noir (English) CD-ROMs as .iso files. I used the UK "Sold Out Software" budget release, on 3 CDs. A multi-platform Realtek AC97 audio driver. and create a single partition filling the emulated hard disk. When finished, hard-reboot the virtual machine (press Ctrl+C on the qemu-system-i386 process and run it again). to create the FAT filesystem. You might have to reboot again at this point. /p j forces ACPI support (Thanks to "Richard S" on the Virtualbox forums for this tip.) /iv is unimportant, but it disables the annoying "billboards" during installation, which advertised once-exciting features like support for dial-up modems and JPEG wallpaper. I used a "Typical" installation; there didn't seem to be much point in tweaking the installed package set when everything is so small by modern standards. Windows 98 has built-in support for the Cirrus VGA card that we're emulating, so after a few reboots, it should be able to run in a semi-modern resolution and colour depth. Discworld Noir apparently prefers a 640 × 480 × 16-bit video mode, so right-click on the desktop background, choose Properties and set that up. This is the part that took me the longest to get working. Of the sound cards that qemu can emulate, Windows 98 only supports the SoundBlaster 16 out of the box. Unfortunately, the Soundblaster 16 emulation in qemu is incomplete, and in particular version 2.1 (as shipped in Debian 8) has a tendency to make Windows lock up during boot. I've seen advice in various places to emulate an Eqsonic ES1370 (SoundBlaster AWE 64), but that didn't work for me: one of the drivers I tried caused Windows to lock up at a black screen during boot, and the other didn't detect the emulated hardware. The next-oldest sound card that qemu can emulate is a Realtek AC97, which was often found integrated into motherboards in the late 1990s. This one seems to work, with the "A400" driver bundle linked above. For Windows 98 first edition, you need a driver bundle that includes the old "VXD" drivers, not just the "WDM" drivers supported by Second Edition and newer. Run the installer from E:, then reboot with the Windows 98 CD inserted, and Windows should install the driver. to swap the CD. Then switch back to Windows' console with Ctrl+Alt+1 and continue installation. 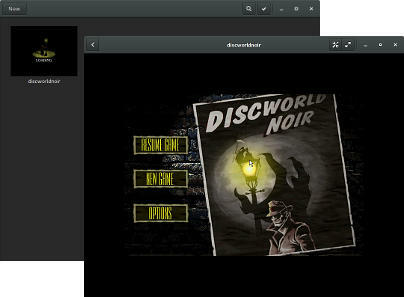 I used a Full installation of Discworld Noir. Here is the configuration I used. It's a mixture of automatic configuration from virt-manager, and hand-edited configuration to make it match the qemu-system-i386 command-line. If all goes well, you should now see a discworldnoir virtual machine in GNOME Boxes, in which you can boot Windows 98 and play the game. Have fun!